This is an experiment in presenting a new recipe for a new dish. 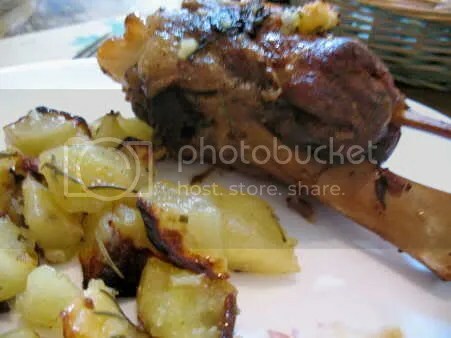 Throughout the recipe I will place photos of the dish, and at the end we can decide which of the photos is most likely to make someone want to cook it or eat it. The dish is yummy, and it could easily have been made another way, but I’ve been pondering on how to make a first course that could be plated in the kitchen and made to look quite special. If I baked it in flat layers it would just look like another lasagna. If I just casseroled it, it would look like baked ziti. I wanted something arranged, orderly, presented, in short. I had in mind to make individual ramekins, but mine are all too small and besides 15 of them would be too much for most ovens when I cook for larger groups. I will make this only when I am cooking with an assistant who can run them to the table, because they’d all get cold if I were doing it all on my own. I haven’t really named it, either. It’s paccheri, of course, and it’s stuffed, and the filling is Sicilian inspired, but it’s not from Sicily, it’s from the nutty cook in Umbria. Have a look at the ingredients and see what you think about a name. Paccheri may not be easy to find where you are, but if you make manicotti and cut them in half it will look about the same, if a bit larger mouthed. You’d reduce the number because each would hold more stuffing. When buying a sausage for this dish, look for the leanest ones possible. You can use salted capers if you like, but rinse them and soak them in milk before using them if you do. The ones I used are just pickled in brine and I did nothing to them. The cheese to use can be any decently mature cheese that is still soft enough to melt. It might be Fontina, Bel Paese, or another you like. I used Pecorino because it is universally available in Italy and it’s really, really good. Sometimes Pecorino in other countries is not. Mix all of the Stuffing ingredients together, squishing thoroughly with your hands. Find a shallow ovenproof dish that is just about the size of all your paccheri stood up on end. Drizzle a little olive oil over the bottom, spreading it around, then a little of the tomato sauce, tipping to spread that as well. Using a teaspoon, one by one, pick up the paccheri and stuff some of the meat mixture into each one. Alternatively and probably easier, pick up a little of the mixture and roll it into a small sausage shape between your palms, then slip it into a pacchero. As each is filled, stand it up in the pan until you have run out of filling. I ran out after 18 paccheri. Pour the rest of the tomato sauce over the standing pasta, then scatter the fresh herb, then add the grated Pecorino over that. Put it into the heated oven and bake about 40 minutes until the sausage centers are done. I measured the temperature at 160°F, and left it to finish the climb from reserved heat. Garnish with sprigs of whichever herb you used. Optionally you may wish to add a few drops of olive oil for gleam. Eat immediately, really hot. Notice that I did not add any salt. Umbrian sausages are extremely salty. Capers are salty. I did not need a single grain of salt. If you live somewhere else, your sausages may not be so salty and you may need to add a little to the stuffing. 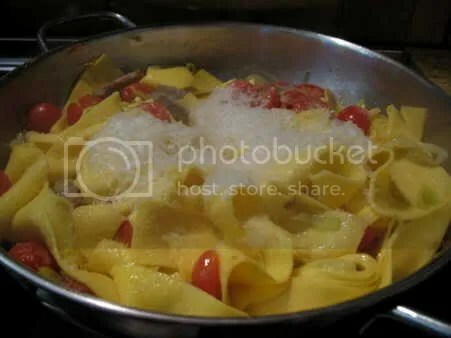 [photopress:Paccheri_presented.JPG,thumb,pp_image] If you click on the photos, they’ll pop up on a dark background and be easier to judge. Which one do you think would tempt you to eat this? If none look good to you, I want to know that, too, but I’d also like to know the reason why! And now, having figured out exactly where it is this week, I am proposing this dish to Presto Pasta Night, hosted this week by Closet Cooking. When you look at that blog, you can see what is possible in countries that have closets. This is basic. Day to day Italian home cooking is not about recipes. It’s about what’s available. No two days will likely be anything like each other. Just like in your house. That’s what was in my kitchen yesterday, every bit of it left over from some other meal except the garlic which is always around. In the kitchen freezer was also a small packet of fresh lasagne pasta, leftover from Easter. I thawed them a bit then used a knife to cut them into 2 cm / 3/4″ wide strips. I tossed those into boiling salted water. It doesn’t take long to boil fresh pasta. Freezing it dries it a bit, so it takes longer than if you’d just made it, but it’s the difference between one minute and two, once the water boils again. 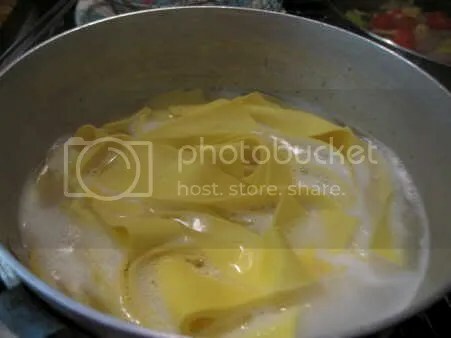 The things in the frying pan cook while the pasta water comes to a boil, then once the pasta is in I add a ladle or two of pasta water to the frying pan. The tomatoes will actually taste better if you add them just before the pasta water, but that doesn’t photograph so well. When the pasta is done but quite chewy, drain it and add to the frying pan, tossing around a bit. Then add some cheese you grated before and toss some more. It will look like this before you toss it. If I lived in a different place, those ingredients would be different. If I lived near the sea there might be a handful of shrimps instead of a sausage. If it were summer there might be some vegetables that were dropped off by a friend with a garden. If it’s Monday the ingredients may be somewhat richer because they are left from Sunday. If it’s Friday they make look a little spare because the week’s money is running out and you haven’t been to the market yet. If the ingredients are very slim, I’ll probably spice them more. I and the strictest of Italian cooks and mums buy only what’s in season or what’s preserved. We don’t throw in the last sausage and say what the heck, because too much really is too much. We don’t add herbs and spices unless we have in mind an outcome that requires them. Of a possible fourteen cooked meals a week, maybe three or four are planned out before the trip to the market. The rest of them are made on the spot from whatever there is. This week I have no onions, no eggs, and few vegetables. But I can still produce a good meal and fill your mouth with delicious. Just like many Italian mothers. It’s hardly even summer yet and I am already having a hard time coming up with recipes for eg’s CSA box! I didn’t want to start on zucchine yet, because I know the day is coming when people will be desperate for what to do with zucchine. But this is the third week she’s had summer squashes, so here we go. The CSA box had lettuce, scallions and zucchine and other summer squashes. I added 1/3 of a pork chop, sliced thin and marinated, garlic and the marinade ingredients. I also added just under 2 ounces of rice stick noodles, cooked and drained. This took about fifteen minutes to make. 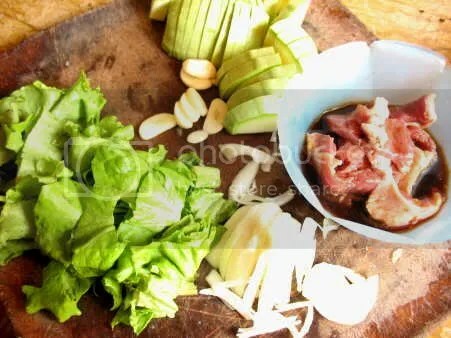 Mix in a small bowl and toss the thinly sliced pork in it to get all the meat seasoned. Leave while you prepare the rest of the stir fry. Cook about 2 ounces of noodles in boiling salted water until just done, drain and hold. Heat a wok or very large frying pan with some vegetable oil. Remove the meat from the marinade. When it is very hot, toss in the meat and garlic and stir fry until the meat loses its red color. Add the squash and continue to cook until they start to look translucent. Add the onion/scallion slivers and toss briefly, then the lettuce which you should toss until it is coated with the moisture of the pan. Add the noodles, then the marinade, tossing really well. 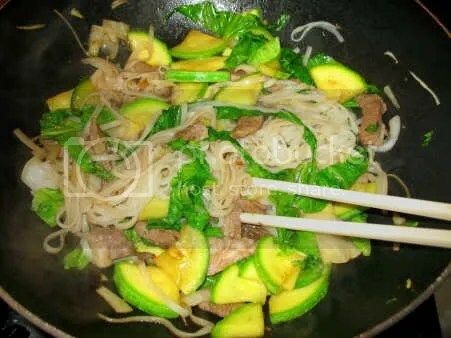 Remove to a serving bowl and optionally throw some minced peanuts on top, like I did because, after all, they are here since we cooked the Viet noodle dishes last week. Serendipity, that. So here is what you get sans peanuts. It would be worth asking your meat department to order fresh pork hocks for you just so that you can say you are having stinco for dinner. Even better is if you can ask someone over to eat stinco. It’s a name that doesn’t translate so well, but it’s really, really good to eat! This was a restaurant meal, but it’s super easy to make at home. I only make it if several are eating though, to conserve fuel. It takes as long to cook one as it does to cook six. This was so much meat I only ate about 15% of it, and the rest went to the kitties. They were some kind of happy! If you want the potatoes as well (Am I insane? Of course you want the potatoes!) Peel them and cut them in chunks, then oil them, salt and rosemary them with the meat and put them into the same baking dish as the pork. The long, slow cooking will make them creamy inside with slightly crisp corners and a salty surface. I ate this dish at l’Osteria in Città di Castello. With wine and service it cost euro 12. A good buy. Make this on a cold and rainy day when you are very busy. Once you put it into the oven, you can go off for at least two hours and nevert give them a thought. This pasta dish reminds me of “Green Eggs and Ham” of which, like most American mothers, I can still quote great swaths of text. I could see it coming, but I was unable to help myself going greener, greener, greener because I knew it would taste so good. This to me is really pasta primavera. This is made of what there really is in spring if you don’t live in Eden. Everybody made bacon in December and January, peas are up in the South, and cream cheese never goes all the way out of style. It will take as long to cook as boiling the water and cooking the pasta takes. Unless you are using fresh peas in the shell, in which case your reward for the extra ten minutes is what will happen in your mouth. This is fast Slow Food: genuine, made from scratch and unaffected by additives and preservatives. Save this recipe for when your CSA boxes arrive with the early peas. 4 ounces or 115 g of a compact pasta such as penne, casareccia, etc. 1 or 2 tablespoons basil pesto—your own from the freezer or bought. Don’t let it overwhelm! Bring a lot of salted water to a boil. When it boils, throw in the pasta and give it a couple of stirs. Heat a frying pan with the olive oil in it, then toss in the cubed pancetta or ham, the peas and the chili pepper and fry them. 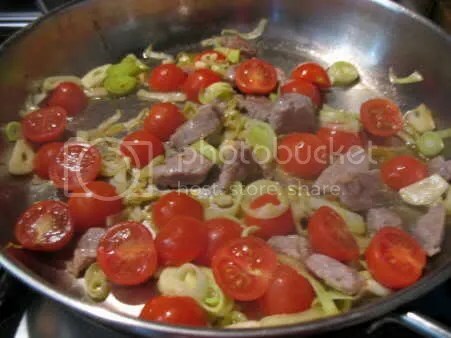 When the meat looks a bit cooked, add a ladle (about .5 cup or 125 ml) of the pasta water, turn down the heat and let it simmer. Just a minute before your pasta should be done, stir in the cheese, then the pesto. If it is thicker than natural heavy cream, add a bit more pasta water to loosen it up. When the pasta is al dente, drain it and put it into the sauce pan, stirring and tossing for a minute. Taste it to check for seasoning. Mine needed absolutely nothing. Serve it smoking hot. I think we will shoot this off to Presto Pasta Night, which will be published Friday on “Food Hunter”s Guide to Cuisine, because Ruth in Canada must really be ready for spring. Just for kicks I added up what this cost per person to make. For the ingredients I bought– the pesto was homemade and leftover– it was about 90 centesimi per serving, or US$1.15. Beat that! What you see is an experiment that worked. It really needs to be called Lemon Peppered Pork with Pappadums, and you don’t have to have the pappadums, but who doesn’t like them? Besides, they are made out of chick pea flour and that sounds like health food to me, right? The most difficult part of the dish will be picking out the pork. It needs to be lean and fairly tender. If it helps I can say that the tenderer parts of pork are often paler in color. It doesn’t need to be as tender as a tenderloin—there’s a giveaway name if I ever saw one—but it does need to be as tender as, say, a pork chop. It cooks a very brief time and that means you are not tenderizing it at all. This pork was quite lean, but I still cut away any visible fat or connective tissue. The finished pork dish is brightly acid and rich all at once. The last step before serving it is to balance the lemon with salt. I can’t tell you how much salt, because every lemon is different, but you’ll know when it tastes right, I believe. I used corn oil for fear that olive oil would add too much of its own flavor, but in retrospect I believe olive oil might add a nutty note I’d like, and that it certainly cannot overwhelm the flavors. The pappadums I bought in either Rome or Florence and I have had them for years and years carefully packed in a plastic bag. I use only a few at a time and I think there were fifty in the package. They look like disks of thick paper when you buy them, but when you fry them they puff and twist into these big fantasy chips. The flavor is like nothing else I know. I wouldn’t say bean the moment I bite into it, but I wasn’t surprised the first time to discover that that’s where the buttery flavor came from. So, let’s make pork and beans. This is easy to double, triple or whatever, but don’t crowd the pork when cooking it. Mix the flour, salt and pepper in a bowl with a fork. Dredge the pork in the mixture, tossing around with the fork until well-covered. Heat the oil in a heavy frying pan. If you use a larger pan you may need more oil. When it is hot, add the cubes of pork, and turning them to cook on all sides, fry them for about five minutes or until they are just cooked through. Turn the heat off and add the garlic and then the lemon juice, stirring everything about to distribute it. Taste and correct with additional salt and pepper. Heat vegetable oil in a small frying pan until it is really hot. I test by breaking off a piece of pappadum and tossing it in. When it puffs up instantly it is ready. One at a time, slide the pappadums into the oil. If it twists a lot you may have to turn it over with tongs to get some parts cooked. Remove with tongs to drain on paper towels. Two per person seems right but I expect three or four is more like it. These have a way of disappearing when you aren’t looking, even if you live alone.